Correct tool path configuration is required to use IntegraStudio. First, you need to install Java. 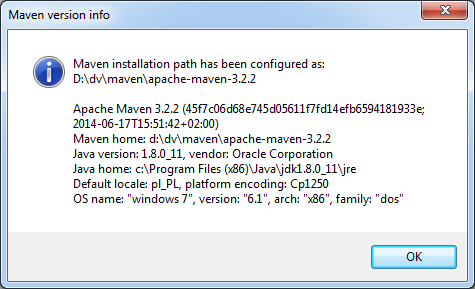 Optionally you might also install Apache Ant and Maven, although IntegraStudio ships with packages of Ant and Maven. Required versions are listed in this section. If you do not enter correct paths, IntegraStudio will ask you for them when you open a Java project. IntegraStudio requires 32-bit version of the JDK. It is important, as the 64-bit version will not work. This is because IntegraStudio runs Java inside Visual Studio process, which is 32-bit and can't link with 64-bit code. Therefore enter a path to 32-bit JDK. Currently both Ant and Maven are required, regardless of opened project type. It is recommended to leave these paths empty, so that IntegraStudio will use default bundled packages of Ant and Maven. If you change any of these paths during IntegraStudio session (when a project have been opened), the change takes effect when you restart Visual Studio. This is because the internal Java machine maintained by IntegraStudio must be restarted completely in order to utilise new classpaths. It can't be done "on the fly", while Visual Studio still runs. In order to confirm that the Maven and Ant configuration has been successful, you can use About Ant and About Maven options from the main IntegraStudio menu (located in the top menu bar). These options retrieve and versions of these tools. If you get results similar to those below, that means the tools are properly configured.